Two days ago, I walked into a doctor’s office and paid them to shoot lasers into my eyes. I felt very Jetsons… very Star Trek… very Galaxy Quest. I half expected Dr. Crusher to walk into the room to scan me. My sole disappointment was the utter lack of sound effects accompanying the laser eye procedure. I would’ve paid another few bucks for a good solid “PEWPEWPEW”. One hour later, I walked out of the office in a very chic (ahem) pair of goggles and 20/20 vision for the first time in my entire life. Science is cool. 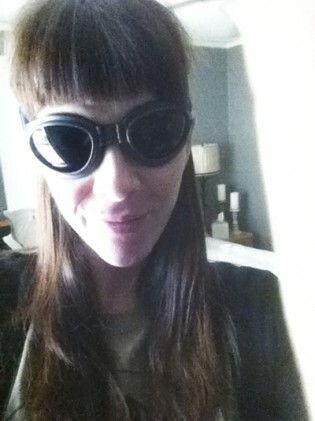 Unlike me in my Weird Al t-shirt and goggles. I did my very best Bono impersonation. I think that judging by the sniggers-not-swoons reception that my attempts received, I should leave the rock-starring to Paul David Hewson and Weird Al (who DOES rock, thankyouverymuch) and confine my rocking to the kitchen. And I do rock the kitchen, goggles or no goggles. Let me tell you, this recipe doesn’t just rock, it rocks. the. Casbah. 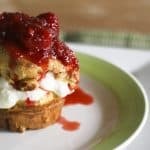 Popovers are simplicity itself: a simple batter thrown together in the blender, poured into a greased pan, then baked at a high temperature until puffy. You already win when you make popovers, but these are special. These are (wait for it…) HEALTHY! Holy moly. It’s true. These are whole wheat popovers. True, they puff ever so slightly less than their all-purpose counterparts, but the difference is negligible really and what you lose in loft (I promise, it’s not much!) you more than make up for in flavour and health. What in the world does a popover have to do with dessert you ask? Oh boy. You are in for a treat. Whisk together some velvety thick Greek yogurt with a little mild honey, then some lemon zest and lemon juice. That’s easy, right? Pop *open* the pop *overs* and dollop the slightly sweet Greek yogurt creme. Then you gild the lily by spooning some sweet, fragrant strawberries folded into just a little strawberry jam. …And pile in the goodies. Add all of the popover ingredients to the work carafe of a blender in the order listed. Blitz on high for 15 seconds. Stop the blender, remove the lid to scrape down the sides with a rubber spatula or scraper, replace the lid, then blitz on high for another 15 seconds, or until perfectly smooth. Put the blender carafe in the refrigerator to rest while preheating the oven to 450°F. 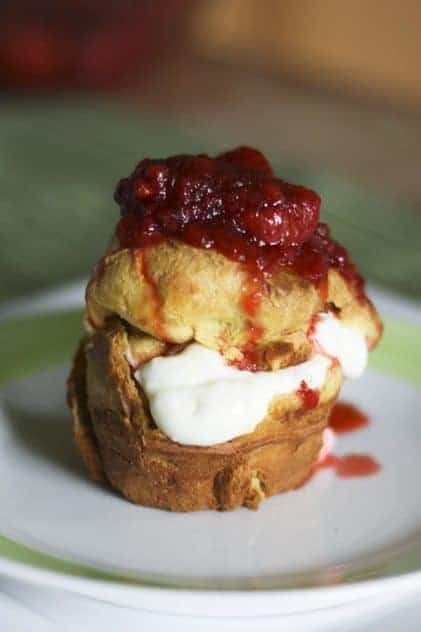 It should take at least 15 minutes to preheat your oven, but if it doesn't, let the popover batter continue resting for a minimum of 15 minutes. While the batter is resting and the oven is preheating, turn your attention to a 12-cup muffin pan. Use a paper towel to generously grease the wells and the top of the muffin pan. Be sure to grease the entire upper surface of the pan. 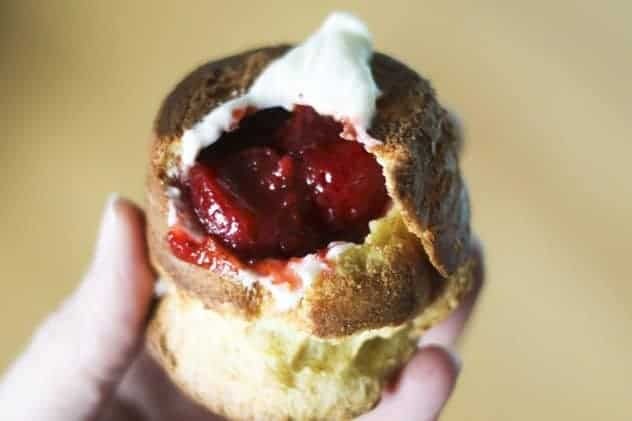 Popovers have a tendency to spread while they puff upward and it's a sad, sad thing to lose a popover because you can't get it out of the pan. When the oven has reached 450°F, divide the popover batter between the muffin cups evenly. This should fill them approximately 2/3 full. Carefully slide the pan into the oven and bake for 20 minutes. Lower the heat of the oven to 350°F and continue baking for 10 minutes more. Do not open that oven door at any point before the full baking time is complete. You will cry a thousand salty tears of regret. 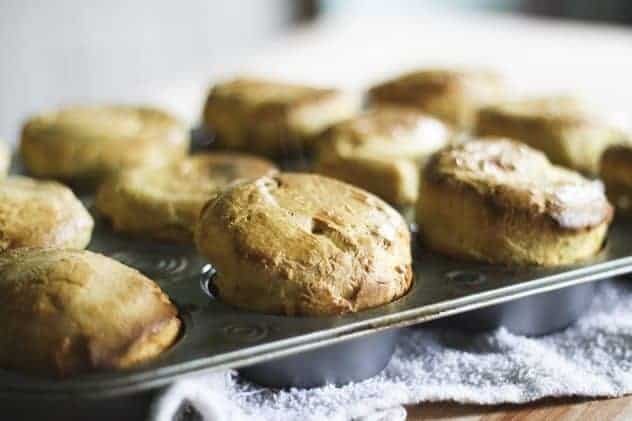 After the full baking time is done, remove the pan from the oven, let the popovers rest in the pan for 5 minutes, then gently turn them out onto a cooling rack. These taste best when served still warm, but are still delicious at room temperature. Whisk together all of the ingredients for the creme until smooth. Refrigerate until you are ready to use. Gently break up the strawberry jam with a fork in a medium sized mixing bowl. Fold in the strawberries. Slice or gently pull a popover in half. Dollop a generous amount of the Greek Yogurt Creme on the bottom half, position the top half over it and spoon the strawberry topping over the whole thing. Serve immediately! This sounds absolutely fantastic! I love it! Laser surgery is a miracle of modern science. I went from 20/1000 (yes, that’s THREE zeros) to 20/25 twelve years ago, and am still at 20/25. Congratulations; your life will change because of this. Onto the food: We often make popovers to accompany dinner, but whole wheat popovers for dessert is sheer brilliance. 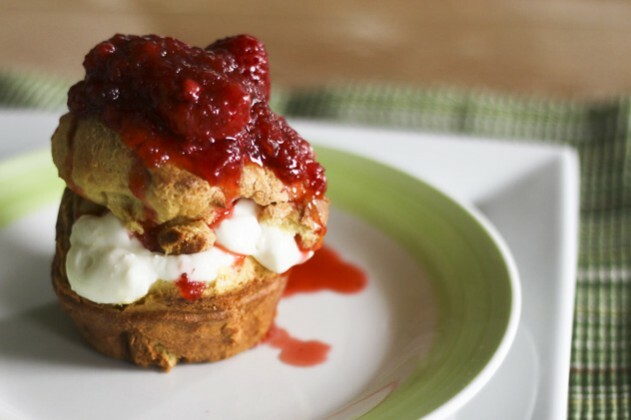 Do you serve hot popovers with cool yogurt? That temperature contrast would be fantastic. I am not a strawberry fan but will try this with cherries. And those popovers and butter sound pretty good also. I’m an almost 10 year Lasik person and mine has held also. PLUS, I was 47 at the time so they backed off my recessive eye a bit and I can still read reasonably sized print in good light without reading glasses also. What delicious kind of dessert..I love eating muffin..Thanks for sharing with us..
Rock on, baby, rock on! These look amazing! Do you by any chance know if this would work with whole wheat pastry flour? It looks taste great. I am silly watery with this post. I make sure that this post I can help me to make like this at home. Probably I was addicted in making pastry, cake, cookies even bread for our snack. I made this thrice a month. My kids really love to taste its different flavor. with cinnamon its the one of their favorite.